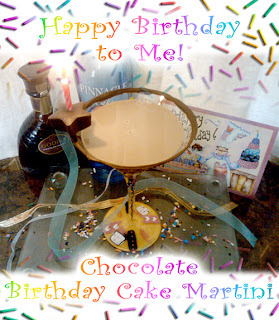 My CHOCOLATE BIRTHDAY CAKE MARTINI - Happy Birthday to Me! 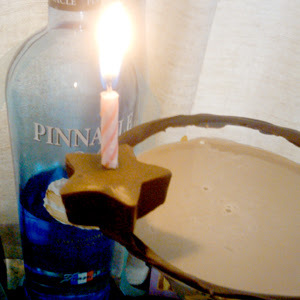 Yup, it's my birthday - again. No, I'm not telling you my age. Suffice it to say that I am still young enough to enjoy a martini, a birthday bash and the other good things in life - but I am wise enough to know who to enjoy them with and to cherish the people and the occasions! 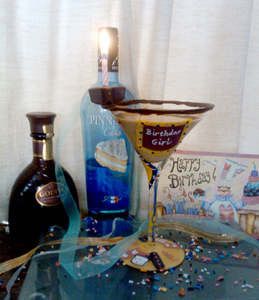 And, yes, I drank it out of my Birthday Martini Glass!